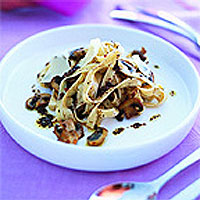 Tapenade makes a wonderful base to many pasta dishes, and this combination with organic crimini mushrooms, a chestnut button variety, gives a rich flavour. The chilli adds a little kick, and the amount you use can be adjusted according to taste. Cook the pasta in a large pan of boiling water for 10-12 minutes, or until al dente. While the pasta is cooking, heat 1 tbsp of the oil in a large frying pan. Add the chilli and cook for a few seconds, then add the mushrooms. Cook, stirring, over a high heat for 4-5 minutes or until all the liquid from the mushrooms has evaporated. Reduce the heat, stir in the tapenade and season carefully, bearing in mind the saltiness of the tapenade. Drain the pasta, tip it back into the pan and stir in the remaining oil. Add the mushroom mixture and mix thoroughly. Serve in individual bowls, accompanied by plenty of freshly grated Parmesan, Grande Mange Blanc bread and Waitrose Gourmet Salad.